Though Sephiroth has no direct dealings with Sora outside of the Olympus Coliseum's Platinum Match, he is alluded to several times throughout the Olympus Coliseum story as the one Cloud is seeking, Cloud's nemesis. In Kingdom Hearts Final Mix, after Sora defeats Sephiroth in the Platinum Match, Cloud and Sephiroth actually face-off, but the final results are not shown. In the English release of Kingdom Hearts, there is no reference to Cloud being aware that Sephiroth was even at the Coliseum. A mysterious man clad in Darkness. 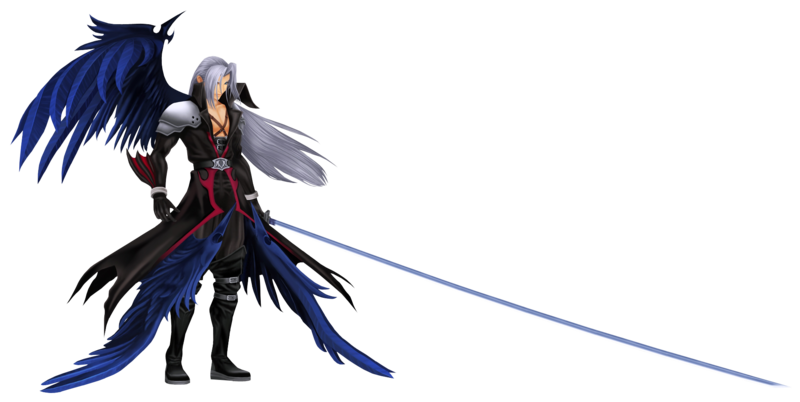 With a single black wing and a sword longer than he is, Sephiroth is an impressive individual to come face to face with. Cloud claimed Sephiroth is the embodiment of his Darkness and will stop at nothing to settle the score between them. Sephiroth was only too eager to accept the challenge as he was quite eager to snuff out that last bit of Light Cloud still harbored inside him. They eventually fought, and Sephiroth taunted Cloud about his incapacity to let go of his past which was the true source of his Darkness. That was what kept bring Sephiroth back, no matter how many times Sephiroth fell or at whose hands. He even went as far as to fight Tifa, a girl willing to offer Cloud her Light. Much to Sephiroth's dismay, Cloud accepted the offer, and the two fought until they disappeared. Even now they continue to fight each other, neither willing to let the other win.